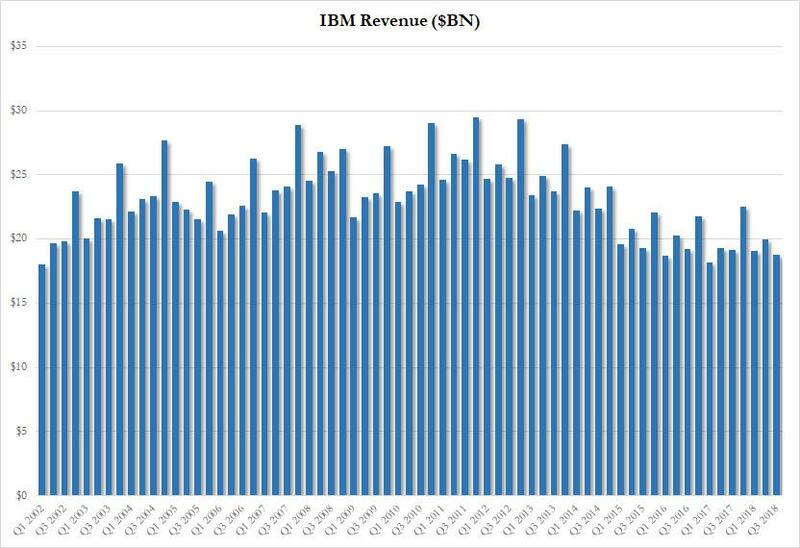 IBM is back to its revenue declining, non-GAAP-EPS-beating-through-low-tax-gimmick ways. With Wall Street expecting IBM to report EPS of $3.40 in Q3, the company "beat" by the smallest of margins, reporting non-GAAP EPS of $3.42 (vs $2.94 GAAP). So far so good, but as usual, the GAAP vs non-GAAP numbers at IBM painted two starkly different pictures, with GAAP EPS barely rising by 1% vs the 5% increase in non-GAAP, while GAAP Net Income and pre-tax Income both declined Y/Y by -1% and -2%, respectively, even as non-GAAP Net Income and pre-tax net income "surprisingly" rose by 3% and 1%. How did IBM bridge the traditionally lower GAAP EPS number to the higher non-GAAP? Here is the full "simple" breakdown. 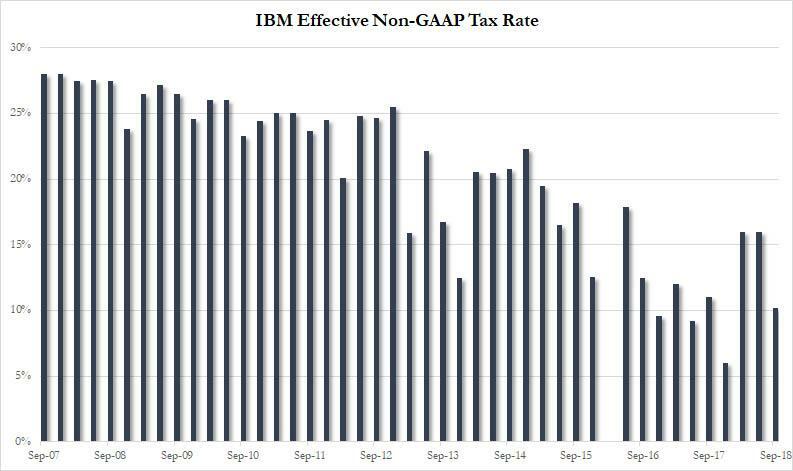 More importantly, the non-GAAP EPS only beat because the company reverted back to its tax gimmick ways, as IBM's effective Q3 tax rate tumbled to 10.2% from 16% in Q2, and down from 11% a year ago. Had IBM kept the already artificially low 16% tax rate, even its non-GAAP EPS would have missed. But it was IBM's revenue that once again got it in hot water: in Q3 the company reported sales of $18.756 billion, missing expectations of $19.08 billion, and the lowest since Q1 2017. 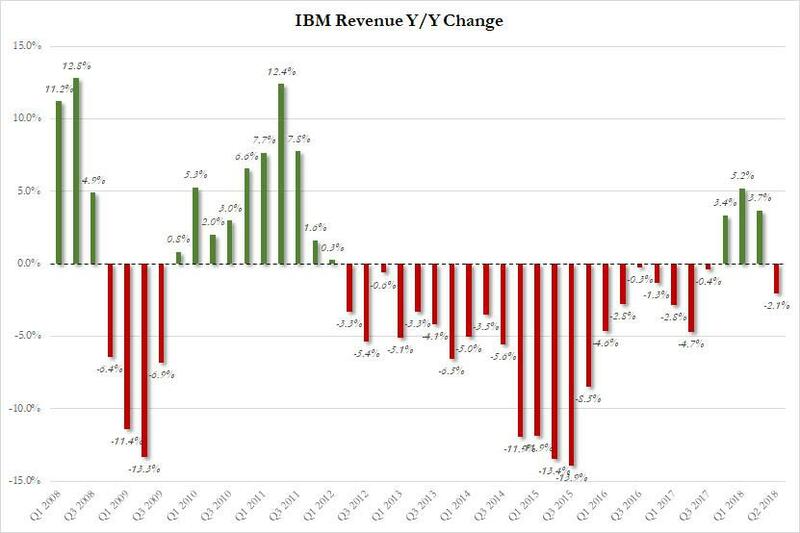 Worse, after three quarters of top-line growth - which followed 22 consecutive quarters of declines - IBM's Q3 revenue once again dropped, sliding by 2.1% this quarter, and reminding investors that for all its non-GAAP and tax fudges, IBM remains a melting ice cube. Adding insult to injury, IBM's Q3 gross margin also missed, printing at 46.9%, unchanged form a year ago, and below the 47.3% consensus estimate. IBM took the opportunity to reaffirm its (non-GAAP) guidance, and said it expects operating (non-GAAP) diluted earnings per share of at least $13.80 and GAAP diluted earnings per share of at least $11.60, as well as free cash flow of approximately $12 billion. Finally, in the latest another bizarre corporate decision, IBM announced that it generated Q3 free cash flow of $2.2 billion. And as has been the case for the past several years, the company returned virtually all of its cash, or $2.1 billion, to shareholders through $1.4 billion in dividends and $0.6 billion in stock buybacks. At the end of Sept 2018, IBM had $1.6 billion remaining in the current share repurchase authorization, which means a new stock buyback program is imminent: for new readers, IBM has repurchased billions and billions of its stock in the past decade, which is the only reason non-GAAP EPS hasn't imploded. IBM ended the third quarter with $14.7 billion of cash on hand, up from $11.9BN at the end of Q2. However, as a result of the cash burn, cash only increased because so did debt, which rose to $46.9 billion, up from $45.5BN a quarter ago. In short: after a few strong quarters, IBM's Q3 results saw the full return of all that investors had grown to loathe about big blue. And, as a result, the stock has once again hammered after hours, sliding some 5% with more selling likely to come.